My name is Corey Drew Johnson and I am currently the pulpit minister for the church of Christ in Hollis, Oklahoma. I have been preaching in Hollis since December 2014 after graduating from Brown Trail School of Preaching in Bedford, Texas. While attending Brown Trail School of Preaching, I worked as a Youth Minister for the Bedford church of Christ in Bedford, Texas. I have worked at many different vocations throughout the years, from retail to fast food management to being a truck driver. I have always worked hard and excelled at my jobs, but I have never been as excited and fulfilled in any of my vocations as when I am preaching, teaching, and working with the brethren. Teaching God’s Word to the world is a passion I have had from a very young age. I have been studying and learning God’s Word from childhood and I was baptized into Christ on October 10, 1991 at the age of eleven. I grew up in a biblically sound family with parents who taught me to have a fervent love for God, both by making sure that I grew up studying His Word as well as being excellent role models for me. My mother, Shirley, would carry a notebook to church each Sunday morning, Sunday evening, and Wednesday evening, where she would take notes of all the verses that were used in the lessons. It was by this example that I would imitate her from a young age. My father, Harvey’s, knowledge of the Scriptures is immense and he was an excellent example to me as well, as I have learned much from him. He would serve on the Lord’s Table and lead prayers, as well as fill in for ministers on various occasions. Because of his example, I too wanted to be active in the church. My wife, Amy, and I have been married for thirteen years, and she has been a member of the church for thirteen and a half years. She was attending the Christian Church before I converted and baptized her. She was seeking the truth and had a lot of questions. I had been a friend of her younger sister, Sarah (whom I also had converted and baptized), so Amy knew that I had a good understanding of the Scriptures. She asked me to have a Bible study with her and two weeks later, I baptized her. She has been a faithful Christian ever since then. Amy has two college degrees—one in Office Technology and the other in Computer Information Systems. She has been serving as Secretary for the Hollis church of Christ for the two years that I have been preaching for them. She has taught children’s Bible classes at the congregations in Ramona and Nowata, Oklahoma as well as Bedford, Texas and is currently teaching children’s Bible classes at Hollis. She is also teaching ladies’ classes at Hollis. While I was a student at Brown Trail School of Preaching, Amy attended their wives’ program and graduated in December 2014. 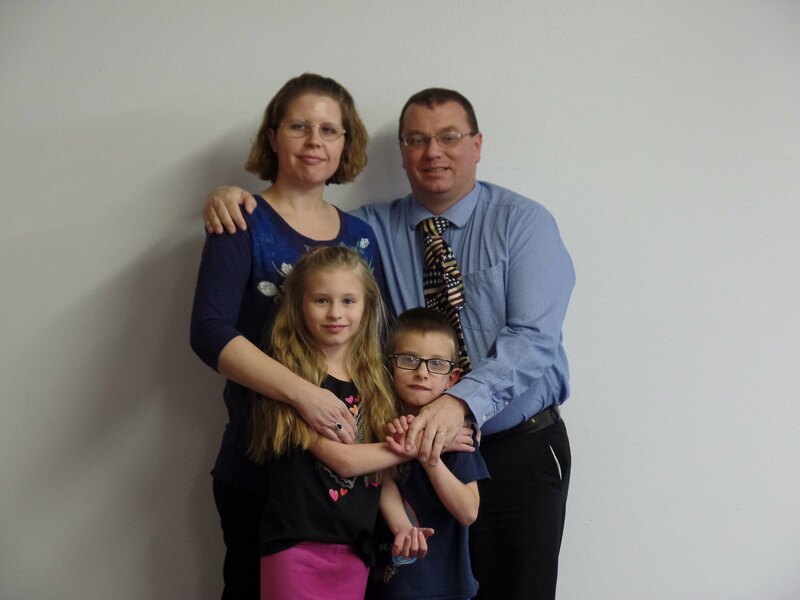 We have two children—Savannah is nine years old and Elijah is seven (see attached family photo). I immensely enjoy working with young people and I have been a counselor for four different church of Christ camps—Black Mesa Bible Camp, Green Valley Bible Camp, Inner Circle Christian Camp, and Quartz Mountain Christian Camp. I have also taught adult, high school, and junior high Bible classes at many different congregations. As a young adult, I also coached Kids’ Incorporated Youth Soccer. I employed many teenagers when I was working as a manager of the Sonic Drive-In in Bartlesville, Oklahoma. Some of these teenagers would come to me for advice and looked to me as a role model. I was responsible for organizing and planning different events for them to attend that would help them in their work. I also worked with other Sonic Drive-Ins to train team members to effectively perform their assigned tasks. Whenever D.L. Rodgers LLC was opening a new Sonic, I was highly sought after by upper management for my experience in training teenagers, as they normally make up the bulk of the crew. While a Youth Minister at Bedford, I worked with a variety of young people—from those who were well-behaved to those who struggle with behavioral problems. My work with the youth at Bedford was rewarding, challenging, and fulfilling. Working with the congregation in Hollis for two years has also been rewarding, challenging, and very fulfilling. My family and I have grown to love the people at both Bedford and Hollis and we will always consider them to be family. I have gained valuable experience from both congregations and I love teaching God’s Word and helping people learn how to apply it to their lives. I am humbly grateful for the opportunity to be considered for the position and I would like to thank you for your time. It is my prayer that with thoughtful prayer and consideration, you will be able to find the best candidate for the position. My objective is to help the Lord's Church grow spiritually by working with a sound congregation to obtain the mutual goal of seeking and saving that which was lost (Luke 19:10) and striving together with the adults and youth to edify them in the ways of our God through the diligent study and application of His Word (2 Timothy 2:15).